John Brimble was very much the founding father of the Tipton Civic Society. In 2002 he wrote the following notes about its origins. On 1st October 1988, John Brimble, Barry Whitehouse and the Tipton Community Association staged an exhibition at the Alliance Community Centre in Stockdale Parade to commemorate the 50th Anniversary of the granting of the Charter of Incorporation to Tipton. This attracted an attendance of around 300 people and the formation of a civic society became a topic of discussion. On 7th October a ceremony was held at Tipton's (Owen Street) railway station to mark its re-opening after refurbishment. John Brimble, Barry Whitehouse, Ray Brothwood, John Bayliss and Keith Hodgkins, all of whom attended the event, used the occasion to get together to discuss the formation of a civic society at greater length and all were very supportive of the idea. On 30th September, John Brimble spoke at the meeting of the Tipton Rotary Club on the formation of a Tipton Civic Society and at that time press coverage was given to the matter. On 17th November 1988 a public meeting was held at the Park Hotel, Victoria Road at which 60 people attended. Keith Hodgkins gave a slide show about Tipton and John Brimble made an address. The result of the meeting was that a Tipton Civic Society should be formed. A steering committee was set up including Ron Statham, Joshua Churchman, Robert Williams, John Bayliss, Barry Whitehouse, Charlie Baker and Keith Hodgkins. John Brimble was elected as chairman and Paul Smith as secretary. The first committee meeting was held at the Park Hotel on 1st December. Best wishes were sent to the Society from many individuals including Miss Betty Boothroyd MP. The Society's aims were to promote interest in the past, present and future of the town. From the very early days the suggestion of a local history museum was put forward. This eventually resulted in the formation of the Tipton Heritage Centre in Brick Kiln Street in 1997. The Society also persuaded Sandwell Council to bring back for display at Tipton Library the Grant of Arms and the Roll of Mayors which had been stored away unseen since 1966. The Society was represented on the committee formed to erect a statue to the Tipton Slasher (John Brimble was its historical consultant) in 1993 and was involved in the renovation of the memorial to the young girls killed in the Dudley Port Explosion in 1922 which was refurbished and rededicated in 1994. The Society has been responsible for the blue commemorative plaques that can be seen around the town, the first being at the site of the Bloomfield Ironworks where Joseph Hall (1789-1862) developed the pig boiling process. This was sponsored by Brymill Limited and 14 others followed. In 1992 it was decided to hold a Tiptonian of the Year contest to find the person who had contributed most to charitable work in Tipton. The first winner was Ray Brothwood (he was not a committee member at the time). As a millennium project the Society erected an anchor on a brick plinth adjacent to the new Neptune Health Centre to celebrate the chain and anchor industries in the town. The Health Centre site had previously been occupied by Wright`s Forge where chains and anchors had been made from the 1850s to the 1940s. It was dedicated in a special ceremony on 26 March 2000 in the presence of His Worship the Mayor, Councillor John Edwards. Each year at Christmastide the Society organises a carol service in a Tipton church or chapel where the readings are given in the dialect of the Black Country. Another significant aspect of the Society's work is its recommendations to the local council on new street names. With the increasing pace of re-development many new streets have been laid out over the past 10 years and the Society has had over had over 100 names accepted. All the names submitted have a local historical or topographical significance because it is our belief that street names are the best way to preserve and celebrate local history. John Brimble died unexpectedly during his regular morning walk on Victoria Park on 24th June 2006. The following obituary by Keith Hodgkins was first published in autumn 2006 edition of The Blackcountryman magazine. John Brimble was born at 225, Dudley Port, Tipton on 21st September 1940. He was educated at Manor Road Infants School, Burnt Tree Junior School and Tipton Grammar School before taking a job as a chemist in the electroplating industry with the Ionic Plating Company in Smethwick.. Despite this industrial calling his heart was always in local history and from his teenage years he had been collecting, researching, recording and writing about the locality. His first published material appeared in the Tipton Grammar School magazine when he was still a pupil. His passionate interest and concern for Tipton and the wider Black Country was intensified in 1965 when he met a fellow enthusiast, Dr. John Fletcher in the Druids Head pub in Coseley, one of the area`s two surviving home brew houses and a Mecca for serious Black Country devotees. The two men were conscious of the lack of recognition that the region had received for its immense contribution to the industrial development of Great Britain and set about to rectify the injustice with the launch of the Black Country Society on 1st January 1967. With John Brimble as honorary secretary the Society quickly became a focus and a mouthpiece for likeminded people and by the mid 1970s had generated a new and positive attitude to the way the region was perceived, both from within and beyond its boundaries. One of the early aspirations of the Society, very much spearheaded by John Brimble, was the creation of a museum of Black Country life. The idea had already been tentatively mooted by Dudley Council but the Society doggedly pursued the issue and at a seminal meeting in November 1968 the two Johns persuaded a group of Council members to set up the trust which was to become the basis of the Black Country Museum. John Brimble was also one of the prime movers who were instrumental in establishing the Friends of the Museum. John stood down from front line committee work in 1985 but continued his writing and researching until 1988 when he became a founder member and first chairman of the Tipton Civic Society, created to reassert the identity of a town still aggrieved by the loss of its borough status in 1966. The formation of smaller town societies within the Black Country was a concept presaged by John in the 1970s when he was responsible for a considerable amount of encouragement for and liaison with other local groups. Today the majority of Black Country towns have civic or local history societies. The Tipton Civic Society became a medium through which John could concentrate on two major crusades. The first was the celebration of local history through street names. John had been pursuing this aim through the Black Country Society since the 1970s but from 1988 over 120 new street names in Tipton were accepted by Sandwell Council on John`s recommendation, all of which commemorate and perpetuate local people, industries and events which might otherwise be lost to public consciousness. The second campaign was to establish a Heritage Centre for the town. The formation of the Tipton Challenge Partnership as a Government funded regenerative body provided the wherewithal for this vision to materialise and in 1995 a small museum was opened in the new St. Pauls Community Centre and John Brimble was appointed Community Heritage Officer for Tipton. All John`s campaigning work up to this point had been in a voluntary capacity but this new post put him in the happy position of being able to follow his vocation in paid employment. Nevertheless his spare time was still spent in the service of the Tipton Civic Society and other bodies such as the Board of Governors of Tipton Green Junior School and the Victoria Park Steering Group.During this period he produced a history of Victoria Park, a collection of his own poetry and co-authored three volumes of Tipton in Old Photographs in the Sutton series. He also served as a Justice of the Peace from 1986. The renaissance of regional identity and the vibrant cultural self expression of the modern Black Country are due in no small part to the vision and campaigning zeal of John Brimble and in 2005 he was awarded the MBE in recognition of his services to the heritage of the region. John was to receive a further honour on 30th May 2006 which, in view of his untimely death less than a month later, has taken on a poignancy of its own. Celebrations for the centenary of Tipton `s old library building on that date saw the culmination of over two decades of John`s efforts to save the building from disuse and destruction. After years of neglect, during which time John had been instrumental in getting the structure listed, Sandwell Council had completed an excellent restoration just in time for its one hundredth birthday and John was invited to speak about its history at the official reopening. To become a part of the story of his beloved library in which he had spent so much of his youth researching local history brought him considerable satisfaction. John died from a heart attack during his regular morning walk on Victoria Park on 24th June 2006 and his funeral took place on 3rd July in St. Matthews church, Tipton. He is survived by his widow Doreen, daughter Joanne, son Jonathan and granddaughter Elizabeth. 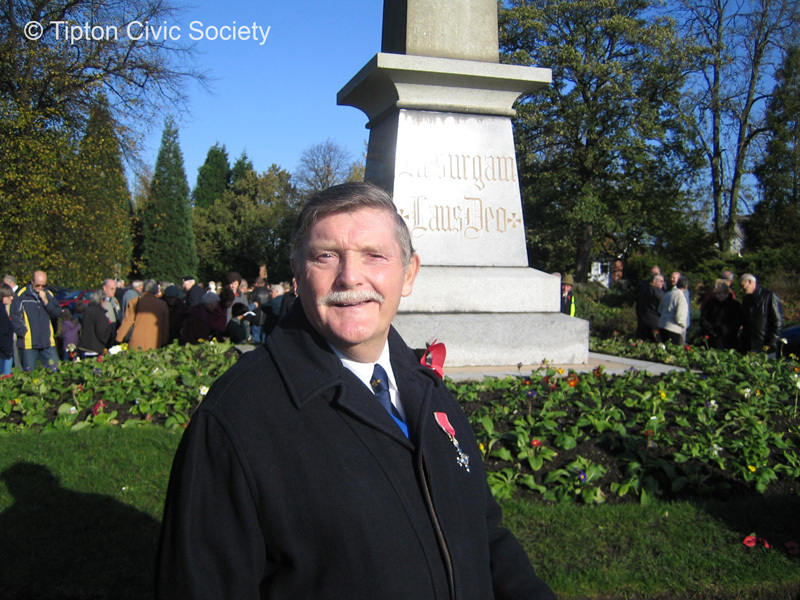 John Brimble wearing his MBE at the Tipton cenotaph on the occasion of the Tipton Service of Remembrance on Sunday 13th November 2005.